Overweight/Obesity: What Does the NWCR Tell Us About Weight Loss? It’s been 25 years since the founding of the National Weight Control Registry (NWCR), billed as the largest prospective investigation of long-term successful weight loss maintenance.1 To date, more than 10,000 adults have enrolled, with about 4,000 active participants at any one time. The registry’s findings are both lauded as a how-to for losing weight permanently and criticized for glorifying what may be disordered eating behaviors. Although participants have lost an average of 66 lbs and maintained the loss for an average of 5.5 years, to enroll, they need to have lost 30 lbs and maintained that loss for a year.1 While this timeline is consistent with criteria set by the Institute of Medicine,2 some experts believe it’s controversial. Another criticism of the NWCR is the fact it’s based on self-report. The registry’s annual surveys include a food frequency questionnaire asking participants to estimate average weekly intake of a long list of foods—challenging for occasionally consumed foods, such as seasonal produce. The survey also asks participants their current weight, but not whether they had gained and lost over the previous year. If people stop responding to the questionnaires, their enrollment doesn’t end. Of the common behavioral traits observed among participants, some do match up with current clinical research, and a few have raised concerns among eating disorder experts. • Television and physical activity. Sixty-two percent of participants watch fewer than 10 hours of TV per week11 and 90% exercise about one hour per day on average—far higher than what’s usually recommended in weight loss programs, but consistent with research findings on the levels needed to aid weight loss and maintenance.12 Observational studies on TV viewing and body weight have found it difficult to uncouple TV habits from dietary habits, physical activity habits, and socioeconomic status, all of which can influence weight and health. 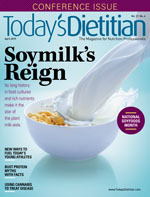 The NWCR annual survey does include a measurement of dietary restraint, and registry members have an average score similar to that of patients who recently completed an obesity treatment program—although not as high as eating-disordered patients.2 A 2012 NWCR study stated that “with the exception of high dietary restraint, participants in the NWCR do not show higher levels of psychological symptoms (ie, depression, general emotional distress, binge eating, and self-induced vomiting) than observed in the general population.”16 A 2018 NWCR study found that participants scored higher than a control group on a key measure of self-control—one that’s associated with higher education. It’s unclear whether it’s an inherent trait of successful weight loss maintainers or a learned behavior.17 Thomas says that a study on body image in NWCR participants is currently underway. Despite these demographics, health care providers actively interpret their findings and the media as “proof” that lasting weight loss is possible—if you practice the behaviors of the NWCR participants. However, the NWCR is an observational study, not a clinical trial, and correlations don’t prove causation. If they did, the participant demographics could be used to argue that being white and educated leads to weight loss. And then there are the numbers. Many of the common features of NWCR participants—breakfast eating, regular physical activity, limited TV viewing, good sleep habits—have value regardless of someone’s current or desired weight, according to health and nutrition experts. However, when working with patients who have weight concerns, it’s important to assess whether behaviors such as self-weighing and dietary restraint are supporting or detracting from their overall health and well-being. 2. Wing RR, Phelan S. Long-term weight loss maintenance. Am J Clin Nutr. 2005;82(1 Suppl):222S-225S. 3. Mann T, Tomiyama AJ, Westling E, Lew AM, Samuels B, Chatman J. Medicare’s search for effective obesity treatments: diets are not the answer. Am Psychol. 2007;62(3):220-233. 4. Ikeda J, Amy NK, Ernsberger P, et al. The National Weight Control Registry: a critique. J Nutr Educ Behav. 2005;37(4):203-205. 5. Thomas JG, Bond DS, Phelan S, Hill JO, Wing RR. Weight-loss maintenance for 10 years in the National Weight Control Registry. Am J Prev Med. 2014;46(1):17-23. 6. Gardner CD, Trepanowski JF, Del Gobbo LC, et al. Effect of low-fat vs low-carbohydrate diet on 12-month weight loss in overweight adults and the association with genotype pattern or insulin secretion: the DIETFITS randomized clinical trial. JAMA. 2018;319(7):667-679. 7. Schoenfeld BJ, Aragon AA, Krieger JW. Effects of meal frequency on weight loss and body composition: a meta-analysis. Nutr Rev. 2015;73(2):69-82. 8. Betts JA, Chowdhury EA, Gonzalez JT, Richardson JD, Tsintzas K, Thompson D. Is breakfast the most important meal of the day? Proc Nutr Soc. 2016;75(4):464-474. 9. Gwin JA, Leidy HJ. A review of the evidence surrounding the effects of breakfast consumption on mechanisms of weight management. Adv Nutr. 2018;9(6):717-725. 10. Ross KM, Graham Thomas J, Wing RR. Successful weight loss maintenance associated with morning chronotype and better sleep quality. J Behav Med. 2016;39(3):465-471. 11. Raynor DA, Phelan S, Hill JO, Wing RR. Television viewing and long-term weight maintenance: results from the National Weight Control Registry. Obesity (Silver Spring). 2006;14(10):1816-1824. 12. Swift DL, McGee JE, Earnest CP, Carlisle E, Nygard M, Johannsen NM. The effects of exercise and physical activity on weight loss and maintenance. Prog Cardiovasc Dis. 2018;61(2):206-213. 13. Goldstein CM, Thomas JG, Wing RR, Bond DS. Successful weight loss maintainers use health-tracking smartphone applications more than a nationally representative sample: comparison of the National Weight Control Registry to Pew Tracking for Health. Obes Sci Pract. 2017;3(2):117-126. 14. Pacanowski CR, Linde JA, Neumark-Sztainer D. Self-weighing: helpful or harmful for psychological well-being? A review of the literature. Curr Obes Rep. 2015;4(1):65-72. 15. Gianini LM, Walsh BT, Steinglass J, Mayer L. Long-term weight loss maintenance in obesity: possible insights from anorexia nervosa? Int J Eat Disord. 2017;50(4):341-342. 16. Ogden LG, Stroebele N, Wyatt HR, et al. Cluster analysis of the National Weight Control Registry to identify distinct subgroups maintaining successful weight loss. Obesity (Silver Spring). 2012;20(10):2039-2047. 17. Bickel WK, Moody LN, Koffarnus M, Thomas JG, Wing R. Self-control as measured by delay discounting is greater among successful weight losers than controls. J Behav Med. 2018;41(6):891-896. 18. Hill JO, Wyatt H, Phelan S, Wing R. The National Weight Control Registry: is it useful in helping deal with our obesity epidemic? J Nutr Educ Behav. 2005;37(4):206-210.